In this article I would like to explain how to do a proper interpolation of the rotation track used in 3DS 4.0 (in MAX this track is known as TCB rotation track - TCB comes from Tension, Bias, Continuity, which are the parameters affecting the spline). Quaternions were invented quite a long time ago by Sir Hamilton, an Irish aristocrat. Their purpose was to describe rotation in 3D-space. To do this we need four numbers - w,x,y,z. What are they? Well, it'll be enough to say the they form a kind of 4D vector - if you are really interested in this topic read [ 1 ], [ 2 ] and [ 6 ]. For us it's important how this vector is calculated. The resulting quaternion has the length of 1. Right here we can see the first disadvantage of quaternions - they were created to represent the rotation about an angle lower than 2*PI - the quaternion for rotation about ( angle, axis ) is the same as for the rotation about ( angle + 2*PI, axis ). Note that quaternion q still represents the same rotation that -q, just as in the angle/axis case. Don't worry if these formulas seem wired (?) - it's enough to know that to multiply quaternions means to accumulate rotations. An important observation here is that if q1 and q2 were unit quaternions then q3 is the unit quaternion, too. q2 = q3 * q1^(-1) q1^(-1) is an inverse quaternion - for an unit quaternion ( w , v ) the inverse quaternion is ( w, -v ). There are several other operations that are possible with quaternions (look into [ 1 ]) but they really look abstract and aren't useful for our purposes. A spline is a polynomial-based function. For each pair of control points we have a separate polynomial (usually of third degree - this means it looks like A*x^3+B^x^2+C*x+D=0). Now maybe in English. :) The first condition tells us that the result of an interpolation must be one line - with no holes or breaks in it - we have to asure that the spline comes through all the control points. The second condition tells us that satisfying the first one doesn't mean we have a spline. :) Doing it with linear functions couldn't be called a "smooth interpolation" - and that what the splines are about - "smooth". p1 and p2 are the control points we want to guide our spline through. 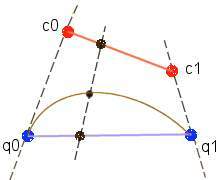 c1 and c2 are the tangents we can calculate when we know points p0 and p3. But in 3DS we have the Kochanek-Bartels spline, which is an extension of the Hermite spline. It introduces three properties for every control point - tension, bias and continuity. Read in [ 3 ] and [ 5 ] for more about them. 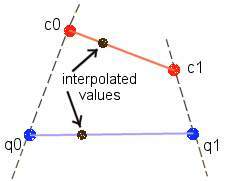 Interpolation of quaternions is more difficult than interpolation of a single value. The only thing we can use is slerp, which stands for Spherical Linear intERPolation. "What?" :) Well, we interpolate between two unit quaternions and we want the result to be a unit quaternion too. This means that they all lie on a 4-D sphere (don't try to imagine this :) - just treat it as a set of 4-D unit vectors). and for t=0.5 the value is equal 0.5, so the result of squad lies (?) between the results of two previous interpolations (between q0 - q1 and between c0 and c1). Let's try do draw what are we doing (all drawings will treat interpolation as a 2D function to make them look clear). When the angle is equal or very close to zero we will obtain some mess. :( And if the angle between q1 and q2 is greater than 2*PI the result will be incorrect. So this is where I had to do some modifications. You may notice that we have 3 cases in such situation. First is the curve at the beginning, second is the straight line in the middle and third is the curve at the end. The point c0 and c1 are the tangents for this part of spline. Since the angle between qa and qb is greater than 2*PI, we cannot use Slerp for the calculation of S0 and S1. Fortunately we know the angle/axis between qa and ab, so we calculate two rotations (around PI and around ( angle - PI )), convert them into quaternions and the multiply qa by them to obtain absolute rotation. The same formulas are used for interpolation af the middle staright-line case. The source is in the bonus for this issue of Hugi, so there you can find all this stuff working. Check this out. Big thanks go to all of them and to you for getting through all the stuff about. :) I you have any question about the topic check out the bibliogaphy listed below, try out the source or try to throw an e-mail at me. "Key Frame Interpolation via Splines and Quaternions"
"The Matrix and Quaternions FAQ"